When you are kayaking, there are times when you will need to let other people know where you are, such as when you are traveling in a group or trying to reach a particular destination down the river at a particular time. Alternatively, you might find yourself in a difficult situation on the water and need to communicate through means besides VHF radios and cell phones. 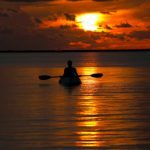 It is essential to have a number of appropriate signaling devices on your kayak and know how to use them properly when you are in an emergency. Having the right signal devices can help you let other people know that you are in need of assistance. There are a number of different signal devices available for kayakers, including devices that are meant to be used exclusively in emergency situations and signaling methods that come in handy when different kayakers are interested in communicating with each other across the water. The primary and most common class of signal devices are visual signal devices. One way to categorize visual signal devices is by when and where they are most effective. Some devices are most effective when used during the daytime hours, while others are most effective when used during the night. There are some that can easily be seen from the level of the water, while there are others that will provide their best visibility when seen from the sky. Good daytime visual signal devices include signal mirrors, orange smoke canisters, and sea rescues. It is important for every personal floatation device to have a signal mirror either attached to it somewhere or located inside a pocket. They are very light weight, they are incredibly simple to use, but they have the downfall of only being useful on days that are sunny. You can see a signal mirror either from above water level or from the surface of the water. Some signal mirrors come with tiny holes in the center that are designed to help you when you are aiming for your target. If you can manage to send out flashes of light in threes, this is the most commonly understood signal for help in a variety of situations; think of S.O.S. The second good daytime visual signal device to consider is an orange smoke canister. These work effectively in bringing you attention whether your help is out at sea or up in the air, but they only work in the daytime. The smoke will typically only last for between 30 seconds and 50 seconds, so if you are thinking of using one, you will want to wait until you are sure that a potential rescuer can see you before you discharge it. The third good daytime visual signal device to consider is the sea rescue. A sea rescue is a banner designed to float on the water out from your kayak. Typically it will be bright and orange and long. A sea rescue is useful in a limited number of situations, such as when you have a rescuer who is looking at the river or lake from a great height, such as from a cliff or an airplane or a helicopter. It can also come in handy if your rescuer is looking at you from a large ship, but in any of these scenarios, it will only be useful during the daytime. However, a sea rescue can stay in the water from the moment you deploy it until the time you are rescued, and you can use it again in the future. Good nighttime visual signal devices include aerial flares, parachute flares, flare pistols, and strobe lights. Aerial flares have the advantage of also being visible in the daytime. Parachute flares are also most effective at night but are additionally visible during the daytime. Flare pistols are brighter and shoot higher than parachute and aerial flares and are also useful in the daytime although primarily meant to be used at night. Strobe lights are recognized everywhere as signals of distress. If you plan to paddle about during the dusk and dawn hours, you should already have a strobe light with you. Keeping all of this equipment handy will help you if you ever need help.